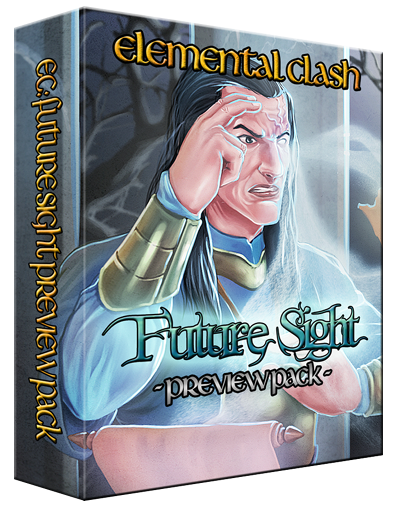 Presenting the Elemental Clash Future Sight Preview Pack! Dear friends and fans of the Elemental Clash Customizable Card Game! This exclusive pack of 35 cards (+1 rules explanation card) will grant you, dear friend of Elemental Clash, an exclusive glimpse into the future of Elemental Clash, into what I have planned for the game over the course of the coming 2 – 3 years. The Future Sight Preview Pack is availaible as of now HERE. If you want to know what you will get with this pack, please read on! starting with the “Tribal Pack: Orcs”, which will be reinforcement packs of about 36 cards all about one new Creature Type. Out of these five upcoming sets, the Future Sight Preview Pack includes one “Unique” Creature, one regular Creature and one Spell, so 3 cards from each of the aforementioned Demi-Expansions, showcasing the new mechanics that will be introduced in these, in order to give you a taste of what is going to come in the future. Tribute is an additional cost you pay upon playing a card requiring a Tribute from hand. This means you have to destroy cards you control as described in the Tribute card. There are Tribute(s) that are mandatory and such which are optional, as stated on the card. If you paid Tribute for a card that is neutralized, the Tributed card(s) will still go to the Archive. If you have 7 or less cards left in your Spellbook, the “Last Stand” effects are applied as specified on the cards. This Spell or Effect is copied as many times as a card with the same name is in your Archive. To Gamble just means you roll a six-sided dice and follow the instructions as described on the card that requires you to Gamble. For a card in play that has Reinforce, you may reveal any number of cards with the same name from your hand and shuffle them into your Spellbook. The Reinforce effect(s) resolve for each, as described on the card. Alright, that is about all I can tell you about the Elemental Clash: Future Sight Preview Pack and the upcoming Demi-Expansions for now. Again I cannot provide you with even a general timeframe when any of these will be available, as all depends on how my financial situation develops in the nearer future. So all I can say is please support the Elemental Clash project by purchasing your copy of Elemental Clash: Legendary Legacy and/or your Future Sight Preview Pack. It is a bargain after all, offering highest quality art and gameplay value at an affordable price tag!